This chapter argues that online academic journals are not only a legitimate venue and sustainable source of disciplinary inquiry, but an important professional development opportunity for graduate students as future faculty and are therefore crucial to maintaining a discipline’s ethos. The authors begin by reviewing the ethos of individually produced print publications in the humanities, paying particular attention to the value such publications hold in helping scholars earn tenure and promotion. 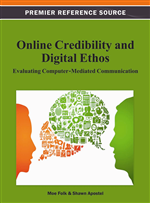 The authors then posit that efforts within the rhetoric and writing scholarly community to recognize the collaborative nature of multimodal digital texts and to advocate for the collaborative production of such digital texts, which has helped such scholarship achieve a higher level of ethos over the past two decades. Emphasizing the role of graduate students in these ongoing efforts, the authors conclude by recommending three benchmarks developing and advanced scholars should implement to increase their own professional development and thus the ethos of online academic publishing: curricular development, team development, and dissertation research. As Hawisher and Selfe noted (1997), editorial roles on scholarly journals are exceptionally helpful to graduate student professional development in that these future faculty are more successfully able to dialogue with both new and established colleagues in a process that is reciprocal and supportive, enabling a mentoring approach in the development of digital scholarship. Although Hawisher and Selfe were writing at a time when online journals were few and far between, in many ways, the advent of these digital scholarly models have helped to achieve this professional goal. This chapter will address the need to provide meaningful opportunities for mentoring graduate students for roles as faculty who foster multimodal composing in both teaching and research; we argue that developing these opportunities is a necessity for all disciplines, but we will focus on existing models of scholarship found in rhetoric and composition to develop our points. In the spirit of Lisa Ede and Andrea Lunsford’s (1990) collaborative scholarship over the years, we will also argue that collaborative journal administration moves away from isolating hierarchical models of mentoring and publishing within the academy toward a community of scholar-teachers. As the Modern Language Association Taskforce on Evaluating Scholarship for Tenure and Promotion (2006) initially suggested, despite the recognition of the potential of various digital tools to produce and distribute collaborative scholarship in the field, very often our incentive and reward systems still privilege single-authored alphabetic literacy models, and tenure and promotion committees, as well as department chairs, have little to no experience in assessing online scholarship. Indeed, Purdy and Walker (2010) argued that “While both faculty members using digital tools and committees charged with evaluating tenure-and-promotion cases have tried to create appropriate categories for digital scholarship, their success remains partial” (p. 177). Our chapter will argue that the scholarly collective necessary to sustain online publishing reacts against traditional evaluative models of scholarship that have limited the voices that can speak and the modalities in which they can be heard. Through our perspective as two editors of the journal Computers and Composition Online, we will advocate for the ethos of digital scholarship as a legitimate venue and sustainable source of disciplinary inquiry, and thus a viable professional development opportunity for graduate students as future faculty.